Create a Storyboard based on the rough plot design outlined in lesson 1. Write a script including stage directions for the animation. Make sure the script and story are coherent, well written, and convey a clear message/moral. Watch about the first minute of this video – another classic of stop-motion animation! Now, in your book, jot down what happened in that time. You will notice your explanation only contains highlights of the animation. We have already agreed that there will have been 1560 frames in that minute. You haven’t described each one. You have focused on key moments. Put another way, if we printed out each frame, but you could only choose 8 to convey the message of that minute of animation, which ones would you use? These would be the keyframes of the animation. You already decided on actors, basic story and location for your animation. You now have to make sure that something happens in the animation you create. In the few seconds you’ll animate, you need to tell a (very short!! story) Our first job is to decide on key moments of this story, and make our Storyboard. 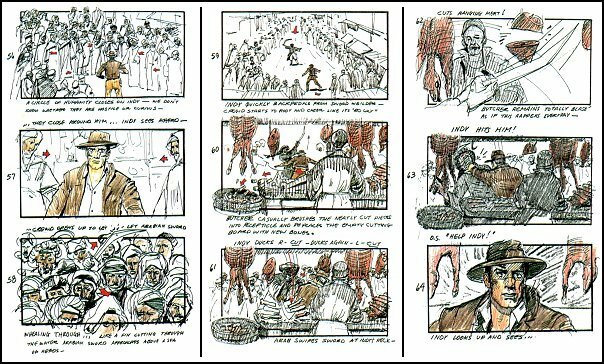 This storyboard shows the structure and planning of a scene from a very famous film! Now you’ve done the storyboard, you’re going to need a script! Green field. Clouds drifting across. Derek enters from the left. Mabel, a cow is stood in the field. When finished, this document will give you all the necessary information to create your animation, and will be the main point of reference as you build your animation.